And Mommy bought me this dress. So can anyone help me guess? Hee hee hee hee, that's wonderful! YAY! YAY!!! That is tooo exciting!! NO CARTWHEELS THIS TIME!! ahhhh!!! CONGRATULATIONS!!! I freaking LOVE the way you announced it! Awesome, awesome AWESOME! 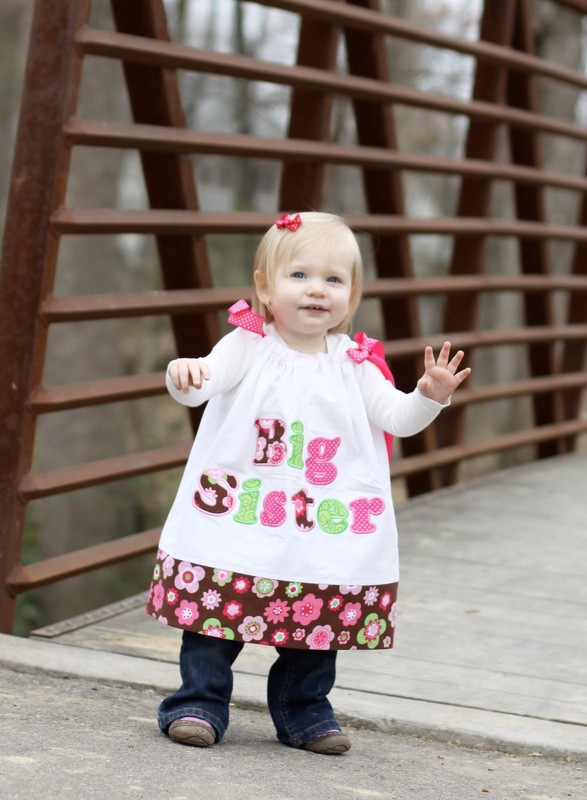 I am so excited for you and Chris, and of course, for Sarah as the big sis! Yay, that is so exciting. Here from Kelly's Korner. Where did you find the Big Sister dress? Or did you make it? Love it!!! Soooo cute!!!! your daughter is adorable!! I hope you are feeling well! Hey Carrie Lou, (and others from Kelly's Korner) thanks for visiting! I'm not very savvy about how to respond to comments but if you want to know about the dress since I know Kelly always tells us where she gets her stuff I ordered it from this woman on etsy: http://www.etsy.com/shop/sunkissedfaces. I had ordered a different pillow case dress for Sarah from this woman for her birthday so when we found out we were pregnant I sent her a custom request for an appliqued Big Sister dress and she sent me about 6 pictures of fabric options and I picked my favorite.